Los Hermanos Cubanos, aka The Cuban Brothers, are all set to release their new album 'Yo Bonita' on May 6 via Jam City Records. The album features the band's hottest tracks; from funk and soul right through to hip-hop and jazz, with special guest appearances from Mica Paris, Kurtis Blow, Tenor Fly, Abdominal, Omar and KT Tunstall. 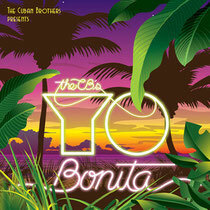 A raw collection of sinewy funk and heavy beats, unusually for a dance album, ‘Yo Bonita’ eschews building tracks around samples in favour of a real band dynamic, which lends the collection of original tracks and inspired covers a groove that is infectious. From crate diggers’ delight ‘Misdemenor’ originally by Foster Sylvers, Sly and the Family Stone’s ‘Underdog’ and Motorhead’s ‘Ace Of Spades’ rendered as you’ve never heard it before to the band’s originals, including ‘The Finding’ and ‘Mike 4 President’, the lay a contagious bedrock for Mike’s vocals. The band will be heading out on tour to support the new album, including a headline show at The Garage in London, and a slot at this year's Bestival.